Will the Jets pass on McCarron a second time? The news will be of interest to the New York Jets, who passed up the opportunity to sign McCarron just 12 months ago when the Bengals offered the quarterback at the trade deadline. It was thought the reason the Jets nixed the deal was because they were more interested in free agent signings and didn't want to have to offer compensation in a trade. 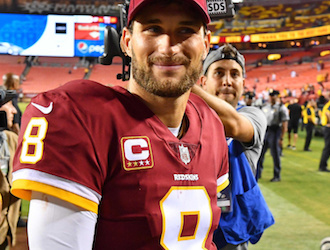 The Jets ended up getting Josh McCown in free agency, which worked out well for them but McCarron certainly gives them something to think about if they can't land Kirk Cousins. Will it be McCarron or McCown for the Jets? If the Jets want to have any chance of challenging in the AFC East, then they are going to have to strengthen. Online betting markets already have the Patriots at +200 to be the AFC Conference Champions, with the Steelers and Texans at +350 and +900 respectively. McCarron could offer the Jets a solid back up option but he is a bit of a mystery when compared to McCown. The fact that McCarron has topped the 200-yard mark only once suggests that his ceiling is more of a solid game manager. Will the Jets be swayed by the fact that McCarron is now a free agent? It is doubtful, as resigning McCown will be cheaper. The Jets will be looking to get the former third-round pick to sign a one year deal at around the $12 million mark, whereas McCarron could cost as much as $45 million and a three-year contract - with $18.5 million of that guaranteed. The fact that McCown started 13 games in 2017 with 267 completed passes for a total of 2,926 yards puts him ahead of McCarron in the reckoning. McCarron has only started 11 games in his NFL career, which highlights the uncertainty the Jets would get with him. McCown coming back would offer a leadership presence to the Jets but landing Kirk Cousins could be a game changer. The quarterback threw 4,917 yards in the 2016 campaign and could offer the Jets a standout player and elite play for a sustained period. To highlight his quality, you only have to look at the last three seasons, where he has thrown 86 touchdowns to 36 interceptions; last season saw him do this whilst missing key guys in his receiving corps and offensive line. Whether the Gang Green can compete with other teams for his signature remains to be seen but they have to do everything they can to get a deal done.